Lady Ainsley Matthews, heiress and darling of the ton, was expected to make a magnificent match. Instead she’s hiding on a remote Scottish estate, terrified that her vicious former fiancé will use her pregnancy to force her into marriage. 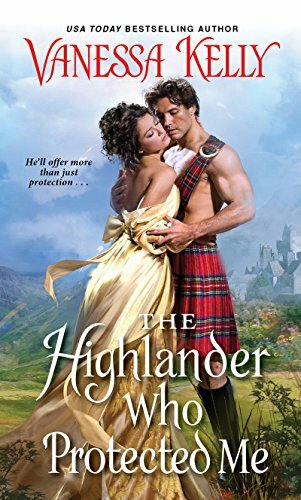 One man can help her—Royal Kendrick, son of a distinguished Highland clan. Though a mistake drove them apart long ago, Royal is the only person Ainsley trusts to protect her baby—even if that means agreeing to never see either of them again . . .
Scarred in body and soul by war, Royal suddenly has a purpose—caring for an innocent babe and thereby helping the woman he can’t stop loving. But when Ainsley ultimately returns to Scotland, determined to be a real mother to her child in spite of the risk, there’s only one solution: marriage. And only one likely outcome: surrendering to the desire that’s simmered between them for so long, no matter how dangerous it may be . . .
Lady Ainsley Matthews shares a moment with Royal Kendrick at an event. He likes her immediately but her fiancé interrupts them and Royal forces himself to put thoughts of her aside. He is a wounded war hero with the love of his family but he struggles to find his place after his crippling injuries. Royal discovers that Ainsley is in Scotland and sets out to speak with her. He is shocked by her pregnancy and wonders what happened to her impending marriage. The story is slow moving. Once Ainsley has her baby, she asks Royal to take care of her daughter since she fears the true father would find out and force her to marry him. Royal who is totally smitten by Ainsley agrees. I found it interesting that a woman would leave her baby with a guy who offers to marry her. She constantly refuses and makes some poor decisions along the way. When I had started this book, I didn’t realize that the characters had appeared in a previous series. It explained why Royal is immediately drawn to Ainsley. I wished I had read the previous book so I could have seen the initial connection. For the majority of the book, Ainsley goes through hot and cold with Royal which drove me crazy since he basically did whatever she asked him to do without question. She is not as kind to him as I had hoped especially after what she suffered through in her previous relationship. I expected more from her. Royal is too good to be true. Towards the end of the book, the action picks up and the villain makes an appearance. He is not really compelling as one but I understood his role. I’m happy that it turned out well for Royal and Ainsley. My favorite moments in the story are those that featured the rest of the Kendrick Clan. They are a riot and I look forward to more stories featuring them. Logan kind of drops a bomb at the end that left the other characters and even myself wanting to know exactly what he meant by this! Overall, a sweet start to the series. © 2019 "Bloggy" by Anariel Design. All rights reserved.